The performance increase for MS SQL Server compared to using mxODBC Connect 2.0's default of using static cursors is enormous: from 2-3x faster executes/fetches for average queries, up to 300x faster for simple cases. For IBM DB2 the effect is smaller, but you still get up to 2x faster executes/fetches with forward-only cursors. For mxODBC Connect 2.1 we will default to forward-only cursors, so that the above setting won't be necessary. 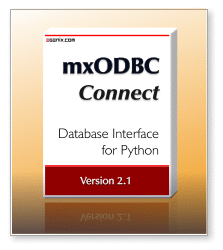 Adjustable.paramstyle: mxODBC supports both the ODBC question mark positional parameter binding style as well as the named parameter styles used by e.g. Oracle. Optionally install the eGenix pyOpenSSL Distribution if you want to benefit from enhanced SSL support. Basic SSL support is available using Python's standard ssl support.